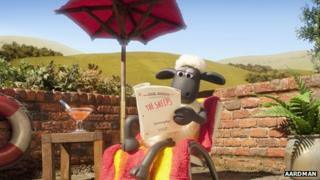 Shaun the Sheep, one of the most popular characters in the Aardman Animations stable, is to make his big-screen debut in spring 2015. Aardman is teaming up with StudioCanal on the film, which will see Shaun leave his farm for a city-based adventure. StudioCanal is financing and will distribute the film in the UK, France, Germany, Australia and New Zealand. The film, to be made using stop-motion animation, will be written and directed by Richard Starzak and Mark Burton. First seen in Oscar-winning short film A Close Shave, Shaun went on to star in a TV series that has been exported to more than 170 countries since 2007. According to Thursday's announcement, the new film's story will see Shaun's mischief inadvertently lead to the Farmer having to leave the farm. The "epic adventure" that follows will have Shaun, Bitzer and the flock go into the big city to rescue him. "Shaun and his friends have a massive global following," said David Sproxton, executive chairman and co-founder of Aardman. "We are very excited about being able to put them into a bigger adventure for the big screen." Aardman's previous features include Chicken Run, Wallace & Gromit: The Curse of the Were-Rabbit and The Pirates! In an Adventure with Scientists.